Sky Sports will take its long-standing partnership with the Professional Darts Corporation (PDC) into its 25th year thanks to a new five-year broadcast deal. The agreement offers Sky Sports viewers over 50 days of live and exclusive darts throughout the year including the Ladbrokes World Darts Championship each Christmas until 2018. As part of the deal, Sky Sports viewers will also continue to enjoy live coverage of the McCoy’s Premier League, World Grand Prix, Grand Slam of Darts, World Cup of Darts and the World Matchplay, which celebrates its 20th staging this summer. The biggest names in world darts embark on a 14-week long roadshow across the UK as they entertain packed-out arenas in the 2013 edition of the McCoys Premier League. Now in its ninth year, the competition will see ten elite players battle it out for a chance to reach May’s finals at the O2 Arena in London. The tournament features a bold new format for 2013 as it expands from eight to ten players for the new season, with Sky Sports screening live coverage of all the action over 14 consecutive weeks, starting in Belfast on February 7. Take your place as the arrows fly once again at the Alsterdorfer Sporthalle in Hamburg for the 2013 PDC World Cup of Darts. The top two throwers from 24 nations will step up to the oche to battle in straight knockout competition and Sky Sports will show all three days of the £150,000 event exclusively live. England’s pairing of Phil Taylor and Adrian Lewis lifted the title in 2012 after defeating Australian duo Simon Whitlock and Paul Nicholson in a breathtaking final. BBC Sport has extended its commitment to screen free-to-air coverage of the British Darts Organisation’s World Professional Championships until 2016. The new deal was announced on the eve of the 2013 tournament beginning at the famous Lakeside Country Club in Frimley Green, and will extend the BBC’s long-standing partnership with the BDO to almost 40 years. 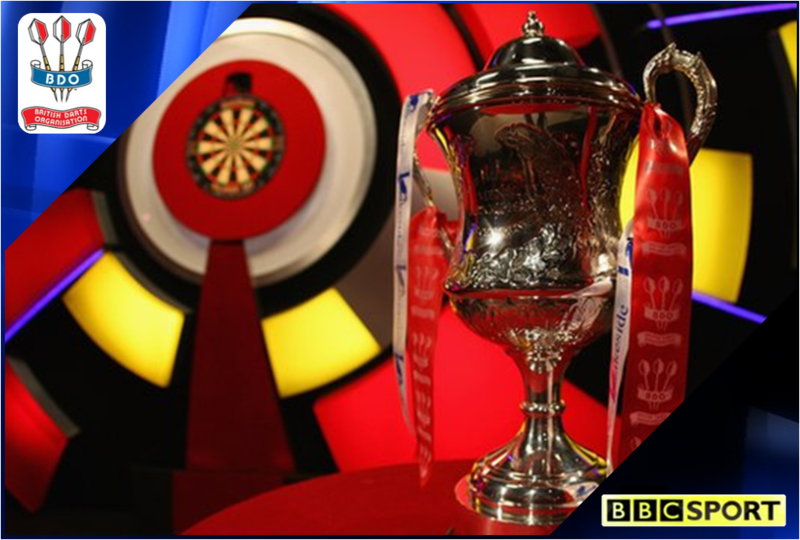 BBC Sport and ESPN will have comprehensive coverage of the 2013 BDO Lakeside World Professional Darts Championships from January 5-13. Dutchman Christian Kist and Russia’s Anastasia Dobromyslova return to the famous Lakeside Country Club in Surrey to defend their titles against the best players from the BDO circuit. For the second year running, both the BBC and ESPN will share live coverage of the nine-day tournament, culminating with the men’s final exclusively live on BBC Two on January 13. Darts’ biggest and richest prize is up for grabs as the 2013 PDC World Championship gets underway this Friday night, live and exclusive on Sky Sports over the festive period. The £1 million tournament will be held for the sixth successive year at London’s Alexandra Palace from December 14 to January 1, where the world’s finest players strive to get their hands on the ultimate prize, which has been in the possession of Adrian ‘Jackpot’ Lewis for the past two years. Sky Sports has live coverage of every throw from every match of the 20th staging of the PDC World Championship, as a total of 72 elite throwers from across the globe will compete over 15 days to lift the new Sid Waddell trophy, renamed in loving memory of the celebrated and hugely popular Sky Sports commentator who sadly passed away earlier this year. A busy couple of months for darts fans begins with the Cash Converters Players Championship at the Skyline Pavillion in Minehead. With the PDC World Championship on the horizon, the £250,000 tournament is the last chance for the top names on the circuit to lay down their marker ahead of the sport’s showpiece event starting in mid-December. All three days of the 2012 Players Championship Finals will be screened live and for free on ITV4 and ITV4 HD. You are currently browsing the archives for the Darts category.